Lombok resorts review and fun guide for families, with tips on Gili dives and a Mt Rinjani climb, by Tom O'Brien, Dominique Mosbergent, and more from Smart Travel Asia and Dancing Wolf Media. Bali's brooding neighbour comes out of the shadows with a new airport, smart resorts, and stacks of adventure from a Mount Rinjani climb to diving. LONG overshadowed by Bali, its flashy, celebrity neighbour across the strait, lush and white-sanded Lombok is finally getting its due. It’s still much quieter than Bali – thank heavens for that – but the island has started to see an influx of eager sun-seekers since the long-awaited 2011 opening of its new international airport. And with good reason. 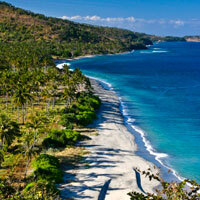 Lombok is home to gorgeous beaches and terrific surf, with lush forests around its central interior. The island also boasts its very own mountain – not hippie hillock – in the form of the imposing Mount Rinjani, one of Southeast Asia’s highest, and arguably prettiest, mountains. It’s also a stone’s throw from the paradisiacal Gili Islands, known as much for their parties as their crystal clear waters and world-class diving. As the buzz grows, travellers have started referring to the island, somewhat unimaginatively, as “The Next Bali”. The comparison is misplaced for these two volcanic creations that are so significantly different in appeal and cultural makeup. Near Senggigi, trundling horses and buggies are common and the parched hillsides look more like scenic Majorca than Bali. To set the record straight, outside of its capital Mataram, Lombok is a simple and conservative island of farming and fishing communities, and with that comes a wild and natural beauty that can only be marginally compared with Bali and Java to its west. Lombok is also a smaller island. See our Lombok map. For now, mainstream tourism remains almost exclusively along Senggigi, a string of five beaches (Batu Layar, Batu Bolong, Senggigi, Kerandangan, Mangsit), with integrated holiday resorts, local “Lumbung” style beach houses and a handful of swish retreats. This rugged, windswept coastline is known for spectacular sunsets tucking behind Bali’s brooding Mount Agung, and this is reason alone for many a visit. Up the coast to Tanjung the 100km stretch of unblemished asphalt could be better compared to California’s Big Sur, with stirring dips and climbs up breathtaking sea-sprayed cliffs. This is a two or four-wheel experience that rivals any ocean drive in Southeast Asia. The new road, proudly referred to by locals as the “black carpet,” is without the sputtering cargo-laden trucks so common all over Bali. For now, the road is an ambitious ribbon of romance, a highway that is easily among the finest in the country. Even Alfred Russel Wallace, the 19th century British naturalist, noted the glaring differences between Lombok and its neighbour. Once over the Lombok Strait, the change is “abrupt,” noted Wallace, who discovered a distinct change in the many plant and animal species on the Lombok side of the deep Indian Ocean trench. What’s more, this is a predominantly Muslim island with Arab influence and an inimitable Sasak culture that is as distinct as the flora and fauna. Here a young Sasak man will “steal” his girl as an accepted ritual before marriage, showing up days or weeks later with parents and family accepting their daughter’s kismet, ready for the occasion. Still, it’s hard to say how growing tourism will alter the landscape and pulse of the island in years to come. With the instant fillip that well-oiled air travel often provides, Lombok is poised to become a key Southeast Asian destination. A “quieter Bali,” as it is now alternately called, it may soon cease to be. When Lombok International Airport first opened in October 2011, “crowds came to watch,” a local businessman said. “Families brought picnics and spent the whole day here. Some had not even seen a plane before. They cheered every time one landed.” Far bigger than the old Selaparang Airport (on the west coast), the newer facility is located centre-south of the island. Aircraft are now a common sight . There are daily flights to and from the island from Jakarta, Surabaya, Kuala Lumpur and Bali’s Denpasar. The main carriers flying here are Garuda Indonesia, ANA, Air Asia, and Lion Air. Getting around Lombok is fairly straightforward. Taxis are easy to find, and probably your best bet. If possible, get a metered cab or be sure to agree on a price beforehand. One thing to note though: Lombok may be smaller than Bali, but roads are few and very circuitous, so some destinations may end up taking longer to get to than expected. For instance, from the airport to Senaru, where many adventurers heading to Mount Rinjani will stay, the journey takes almost three hours by car. To Senggigi, the journey can be an hour or more. Check with your hotel about airport transfers. In Senggigi’s central town along the main road (Jalan Raya), the rough and ready tourist village has seen better days. Once backpacker central, the town thrived. These days, its welter of shops and simple businesses servicing the hospitality trade can’t decide whom they should market to. The backpackers are still around but not in the same numbers and the more upmarket travellers are in search of something more than a Bintang beer and pizza. But the town is awash in Internet shops, air-sea ticketing agents, Komodo diving and trekking tours, surf lessons, antique shops and art galleries, moneychangers and all else under the equatorial sun. Leading a modest change are restaurants and art galleries, some new and some long established, embracing the changing demographics and new investment. For Senggigi restaurants, perhaps the best food to be found outside the hotels is at Asmara near the Sheraton. The 150-seat restaurant and beer garden with its detached art and curios gallery has been in business for 14 years. Owned and managed by German-born Sakinah and her affable, Rastafarian-haired husband, Iwan, the roadside joint is all to like. Sakinah refers to her comfort food as “honest,” cooked with the freshest ingredients following her childhood memories of wholesome Germanic dishes. In an empty, glass water tank near the main street lobster is delivered by late afternoon. And in a further display of freshness, just alongside the restaurant grow rows of basil, tarragon, mint, oregano, rosemary, dill and parsley. Like most of Senggigi’s decent restaurants the place is packed in the evenings. Cafe Alberto, an open balé-style Italian restaurant located between Batu Bolong Beach and the main road, Jalan Raya, is likely a concept that wishes to mimic the successful formula of La Luciola located on Legian Beach in Bali’s fashionable Seminyak, which for years has been regarded as a runaway success. The smell of brick-oven pizza wafts along the beachside air and the long communal tables and shared balé are a convivial touch. Rosy-cheeked expats and tourists work hard sucking down beers at The Office bar and restaurant. The weathered, barn-shaped building, open to the beach could be seen as a typical guys’ joint for its large screen TV, sports calendar, pool table and beer-slinging waitresses. The English-owned venue offers several key exterior features popular with families and couples too. An outrigger fishing fleet, beached a few metres from the restaurant’s tables makes for an interesting backdrop. And 5pm heralds the start of another kind of frenetic live sport as dozens of swarthy Sasak men busily prepare their boats, nets, and gas lanterns for a night of fishing. On the street side of The Office is Senggigi’s art market, more of an emporium of cheap textiles and bric-a-brac in simple, low-slung buildings, than any kind of serious art gallery. The Square, opposite the Bayan gallery is one of the strip’s younger eateries with a small bar and all sides open to the street. It is strangely ranked as one of the best places to eat. I couldn’t see where the allure comes from and could only assume it’s a convenient place to pour over purchases from Bayan. Within the tightly packed shop are wooden handicrafts, home wares, pottery, ethnic accessories, masks and rattan with prices ranging from US$1 and with services for packing and shipping of large orders. One could easily while away an hour or two here. Touts or, pramans as they are known in Indonesia add to the colour of the strip, providing a rapid-tongue succession of what they are absolutely sure you need, depending on age and gender. But it’s the enviable linguistic ability to switch from Italian to French, to German and finally to my English that seemed more impressive than what they had to sell. Transport? Diving? Trekking? Lady? No, no, no and (pointing to my ringed finger), absolutely not. While these fellows may not be completely innocent, they are harmless and even helpful. I was given the inside scoop on the entire strip, from local politics and recent developments to the most popular pirated DVDs and the best handicrafts from one fellow sporting fake Prada sunglasses and flash Nikes (I did finally settle for transport on the back of his motorcycle to my lodging on Mangsit Beach, a 15-minute drive away for a negotiated fee of Rp15,000 or US$1.60). The exchange rate is roughly US$1 = Rp14,100. With the new airport comes new accommodation. In the ‘90s, under then-president Soeharto’s administration Lombok developed over several years with large integrated beach resorts. Then, like the island’s lower-yielding rice fields, the plots of vacant palm groves went fallow from lack of funds and more than a decade of unfortunate events: SARS – now a dim memory – a few notable economic downturns, the two Bali bombings and the ripple effects of the tsunami in Sumatra. Deciding on where to stay we did what most travellers tended to do: we trawled Google and took a look at TripAdvisor, the polygraph test of travel and hotel research; not admissible as absolute proof for a decent place to stay but it was tempting to take a look at the results anyway. Most hotels on Lombok seem popular and without many bad reviews. Such favourable ratings may have something to do with lower expectations of this lesser-known island or perhaps because Senggigi is a simple destination. Some accommodation is close to the ground and basic and some lofty in standards, service and style. Plus there’s everything in between. Invariably, all accommodation is either on the main road, with beachside being more popular though some hillside properties are also in demand depending on the views. All beaches are of the coralline variety with patches of finer sand on some. The conditions of the coral underwater vary and it’s always advised to take along neoprene beach boots, although most of the better hotels have them available upon request. Be careful of sea urchins, spotted in a few clusters near the shore. You don’t want to get your soles punctured by their long spikes. On with our Lombok resorts review and island fun guide. The closest hotel to the airport in any destination never usually ranks high. Located on Batu Layar Beach, the first of the five beaches along the strip heading north, Indonesian hotel chain, Jayakarta, opened in 1993, still proudly hangs its shingle. Here is a time capsule back to the glory days of the Soeharto era when this hotel was likely the bee’s knees. For those Indonesian history buffs yearning for a style reminiscent of the nineties when clove cigarettes could be freely smoked in banks and government departments, and when it was typical and expected to hang pictures of the president and vice president in gilded frames at the reception, this is the place to be. There is a laboured pace and genteel manner that you’ll either love or loathe. The property does have Wifi throughout, two restaurants, a spa and beach cottages (that aren’t really beach cottages); but its most redeeming features are easily the mature gardens and lagoon pool. Just up the road Indonesian-managed Hotel Bintang Senggigi, opened in 1996, is considered to be on the low end, though its 38 bungalows and three deluxe cabanas and five gazebos are built high off the ground providing decent sunset views. Find free WiFi, a restaurant, and swimming pool. At Batu Bolong Beach there’s a greater density of accommodation, shops and restaurants. At the entrance, Sunset House appears scruffy although once in the back garden the property opens up with manicured gardens, winsome staff, a little restaurant, elevated balé, pool, and a very swimmable part of the beach. Its 14 bungalows offer lower and upper floor units with free WiFi. 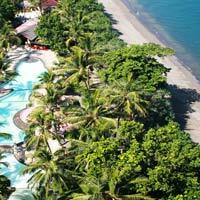 Indonesian operated Hotel Graha Senggigi, another hill and beach divided property has 39 rooms in total, with free Wifi. There are two restaurants, one specialising in Chinese food and hillside views are excellent. The nine-room Lina Hotel is without a swimming pool. The owner pointed to the ocean and gestured with a smile there’s plenty of swimming available. Spotty WiFi and no website although the place does double as a dive centre. There’s a stunning view from the restaurant serving delicious home-cooked food. 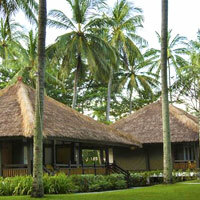 The back to basics Dharmarie Hotel located in a large palm grove on the beach consists of nine cottages. There’s an air of musty fatigue about the place but the location is central and convenient. There is Wifi but no website. The restaurant offers breakfast only. Bukit Senggigi Hotel, smack in central Sengigi across from Pool Villa Club, provides twenty-eight rooms with WiFi in its restaurant serving Chinese food. The hilly location offers excellent ocean views. Across from Bukit Senggigi Hotel, the decade-old Pool Villa Club is built as a sub-property to Kila Senggigi Beach Hotel Lombok on the same massive grounds. This upmarket resort is designed as a premium extension and offers two-floor apartment-style suites with a large bedroom upstairs and foldout couches on both floors. Lower floors directly access the lagoon pool with decent privacy. The grounds are serene and the property close to the beach with pool club guests provided access to all facilities at the Senggigi Beach Hotel. The place is well managed and accommodation suitable for families and couples wishing not to venture too far. WiFi is free. This is a fairly family friendly Lombok hotel for your diary. 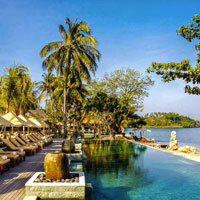 Opened in 1987, the Kila Senggigi Beach Hotel Lombok, formerly the Senggigi Beach Hotel, has stood the test of time. It’s a vast property that offers detailed signage but still requires directions from staff depending on how much you’ve had to drink. Like all of Senggigi’s large integrated resorts, the gardens are heavenly with abundant colour and plenty of quiet and shady precincts no matter how busy the hotel happens to be. There is a long list of places to eat and drink in, and in fact the copious venues could be the hotel’s specialty to keep families occupied. 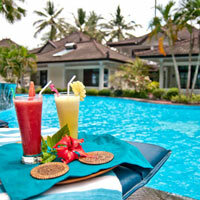 The Kila Senggigi offers accommodation ranging from rooms to bungalows. Its Sea View bungalows are the preferred choice, located just near the lapping shoreline and talon-shaped peninsula with beaches on either side surrounded by a reef. Beaches here are quite good for swimming. WiFi is free in the restaurants and lobby. This is a very child-friendly Lombok resort, so bring the tiny tykes along. 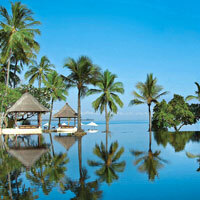 It also scores high on our Lombok resorts review. Along the same road is the Mascot Beach Hotel, a locally owned 22-room facility with beachfront bungalows. The WiFi is deemed to be spotty, and there is no website or swimming pool, though the place is equipped with a restaurant serving Indonesian food and simple breakfasts. The twenty-year-old Santosa Hotel, formerly the Intan Laguna, is Javanese owned and said to be the largest hotel in Lombok with 194 rooms. The Santosa is a family hotel with heaps of recreation for kids, two restaurants and overall good standards set on 7.5 hectares of mature gardens. Dining options are aplenty along the main street. WiFi is free. 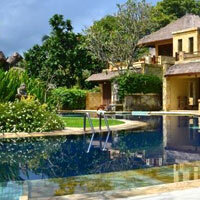 The hotel is made up of rooms, suites and villas, with pool villas as the premium accommodation. There’s a large lagoon pool and swimmable beach. This is another among the child-friendly Lombok hotels to potentially consider. Up on the hill across the road from the Sheraton, Singapore-owned and managed Kebun Villa Resort consists of 12 pool villas, a main swimming pool and a Thai restaurant set on 20 hectares of land with lush, often wild gardens. Lincoln, the boss, a veteran in the hotel industry and loquacious Singaporean, ensures guests receive the best service on the strip. Wild pheasants locals call “pearl chickens” amble throughout the restaurant and grounds. The executive style villas seem designed for Singapore travellers with a no nonsense, service oriented feel. There’s a pool table by the bar with large screen TV and Lincoln is quick to pull together barbecue nights at the request of guests. Heading down the hillside property, Kebun has built a bar on the main road across from the Sheraton. Free WiFi can be accessed throughout. On the east coast of Lombok, just north of Mataram and close to Senggigi is the attractive Svarga Resort in a modern cubist style with its Hagia Spa, and elevated infinity pool with breezy views, and contemporary rooms, some with outdoor showers. This is an intimate resort with 25 units all connected by walkways that run along a gentle hillside past water features and gardens. Families can opt for a larger suite (Varda) with more space and added amenities. With a steep hillside location across from the Sheraton and a short amble from the art market, Puri Bunga Hotel provides fetching views and proximity to shopping and restaurants. The Dutch owner and manager, Marcel, promises the property -- with its 50 hillside bungalows and restaurant with dramatic Lumbung ceilings -- has some of the best hillside views on the strip. Off the restaurant is a large swimming pool with automobile inner tubes serving as floating chairs. Opened in 1990, the Sheraton Senggigi was another of the ambitious big five-stars with marble floors, a grand lobby and a variety of restaurants designed for upmarket families and couples. The property remains attractive and that would have to be largely credited to its lush gardens filled with birdsong, lagoon pool and quiet corners with plenty of deck chairs. The hotel is a well-greased vacation machine that may not stack up with the stylish “boutique” resorts and villas increasingly on offer, but like the other big resorts of the day, the place is busy and appreciated as a star-rated tropical holiday. Enquire about its two villas or the wing of ground floor rooms with wide decks and direct access to the gardens and beach. WiFi is available free throughout. Set on two hectares of land, the Pacific Beach Cottages, located on Kerandangan Beach is equipped with 23 rooms, eight of them on the beach. WiFi is available in the restaurant and by the swimming pool. Indonesian owned and managed Alang-Alang Villas (named after the widely used grass roofing) totals 20 bungalows and villas. There’s a swimming pool with traditional massage provided at poolside only. WiFi is free. The roadside garden fence fronting Puri Mas Resort is tall and, along with the gold signage and Rottweiler tugging at the guard, creates an impression that something luxurious lies on the other side. Opened as an owner’s residence back in 1987, the property would have been well talked about in cliquey travel circles from Amsterdam to New York. The story would have read right out of a novel about how a world recognised ballroom dancer and art collector, Marcel de Rijk, opened a swank villa on a remote beach in Lombok with a style then only experimented with on Bali. Starting with a simple idea for a private residence, this property and resort has grown from its original village of quaint bungalows to high service standards and hip private villas with a décor that is shamelessly contemporary though ethnic Indonesian is at its core. Born in the Netherlands from a long family of dancers with deep ties to Indonesia, de Rijk is vice president of the World Dance Council. On Lombok he is a well-recognised figure, as much for his achievements in hospitality as for his altruism in providing more than 80 Lombok dance students professional certificates through his dance academy and studio. Separated from the beachside resort, the dance facility is located a few kilometres down the road on a hillside where he keeps a home replete with antiques and art, a property that’s also the location for the resort spa. Just off the beach there’s a bar and restaurant with numerous black and white images of de Rijk in formal wear executing sweeping, chin-straight dance movements. WiFi is available free throughout. The high-ceiling Lumbung craft gallery peculiarly doubles as a gym and separated only by a floor to ceiling curtain. Could this be a place to sweat over your purchases? Whatever it is, here’s another example of the uniqueness of Puri Mas and its owner. 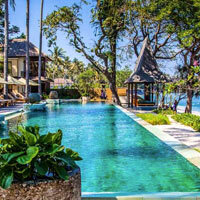 The property gets high marks on our Lombok resorts review. Qunci Villas, or “key” in the Indonesian language, is one of Lombok’s easy-to-like newish resorts with a standard and design that works with great aplomb throughout its villas and stunning tropical grounds. Opened in 2008, and driven by a building fervour, the property has expanded to encompass three different resorts spread from beach to hillside. On the top-end is the hillside property with two-and-three-bedroom villas, all with stunning views, private butlers and chefs available 24 hours. 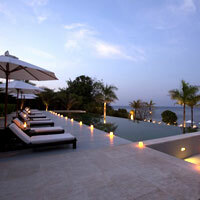 The second property is the “villa hotel” on the beach and the third, a cluster of 20 separate garden villas and spa. Qunci could appear a tad schizophrenic but there’s a lot to love about the place. At happy hour when the sun begins to sink behind Mount Agung, there’s a vibe here that could be compared to venues in Bali’s fashionable Seminiyak, with deep lounge seating and the young and beautiful nibbling on each other’s ears. But then voila, smack at 7pm, an orange glow on the horizon marks the end of sunset, a soothing jazz track preps appetites for dinner, and just like that the character of Qunci is transformed. If Qunci is trying to please all ages, it does a pretty good job. Holiday Resort is another of the big integrated resorts that opened in the 1990s. Its lobby is grand although tempered with down-home, rustic Lumbung style architecture. With dwellings on either side of the road, the resort totals 158 rooms, 30 of which are family units. Owned by Bluebird Taxi headquartered in Jakarta, taxis for hire are understandably everywhere. An unabashedly family hotel with two-storey apartments across the road, here’s another example of how big can be perfectly OK. WiFi is free throughout. Also find two bars and two restaurants. What to say about Windy Beach? There are 14 close to the ground bungalows of the cheap-and-cheerful variety, equipped with a swimmer’s pool and “Sundowner Bar,” that isn’t really a bar so much as a weathered table with stools. Still, Windy is friendly and set in a wild garden and palm grove minutes from central Senggigi. Wifi is free. At the very end of Mangsit Beach, and really the last resort before the remaining 40km drive to the harbour that connects the Gilis and further up the coastline to Tanjung, is Jeeva Klui Resort. Here’s a place that approaches near perfection. The latest addition to Mangsit Beach, Jeeva Klui provides couples and families a stunning example of a sensibly built resort along a grassy seaside expanse. This is a beach house scene par excellence, an incredibly well thought out ideal combining casual with well-crafted detail. Totalling 35 units ranging from single and two-storey beachfront houses, to separate two-storey back garden “suites”, hidden pool villas and a more recent development of two-floor apartment-like units on the high-end, Jeeva Klui somehow nails it. Overlooking the beach and bookended by headlands, this stylish and homey property takes advantage of reclaimed wood and natural materials from Lombok, Bali and Java such as the cool-on-the-feet Lombok-made terracotta floors. Three elevated balé-style gazebos line the property and a fourth with chill-out furniture is located at the end of the beach with a large wooden deck just below a traditionally built, multi-level spa facility – the best spot for sunsets. There’s a pool by the restaurant (best breakfasts on the island), lounge seating and the Wallace library with a wall of books, marine telescope, comfy furniture, board games including backgammon, and an Apple G5 for e-mail. WiFi is free in the library and restaurant as well for those guests in the pool villas and apartments. The design is natural and soothing throughout, with green attributes. Here amongst its grounds and along its windy shoreline toddlers run free and couples sink into books and conversation. 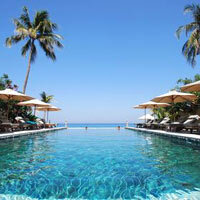 With its superb food and snappy service, Jeeva Klui sets a high bar as one of the top Lombok resorts. The name “lodge” conjures up images of crackling fireplaces, wall-mounted moose heads and snowshoes. No such thing at the pricey Lombok Lodge, where all seems to be black and white, the architecture inspired by Stanley Kubrick’s A Clockwork Orange. With its hospital white interiors and exteriors, and raven black staff uniforms (they must resent management for this idea each time they step into the blazing sun), the place seems more an architectural whimsy with very little local flavour. Opened in June 2011, and officially referred to as “romantic minimalist,” the ultra-modern hilltop retreat with its seven “luxury lodge suites” points towards an infinity pool – and bar below – and the Gili islands beyond. Located on a windy bluff, the suites offer decent views from the decks with oversized cushions on day beds where sun-cream anointed guests pout. There’s free WiFi throughout, a spa, and a restaurant specialising in Peking duck and pork ribs. Rooms are spartan but that’s the concept. Hermes bathroom products are provided free and the BOSE sound deck is a quality touch. Top-end Hotel Tugu Lombok is nothing short of a fantasy paradise that mixes culture and history with recycled art and objets trouvés. With a design engineered with absolute brilliance, the property and accommodation is part collector’s residence and part luxury hideaway, all wrapped in a delicate and time-honoured style of yesteryear. Hotel Tugu Lombok, like its sister properties in Bali and Java, is a destination that can’t be compared with any other, anywhere. With hundreds of pieces of art at every step and every turn, and with the added dimension of ultra comfort and sophistication in its pool villas, the property is quite easily considered the finest on the island, and certainly the most interesting. Tugu is not just a testament to old world charm. The hotel is equipped with a spa and fitness centre and is an excellent launching point to the Gili islands. Its six villas, five bungalows and eight suites with private pools range from 107-400 square metres with in-room iPod and 42-inch flat-screen TV. WiFi is free throughout. Sire Beach is likely one of the best for swimming along this northwest coast. There’s also an 18-hole golf course within walking distance of the hotel and yoga and meditation in the open air spa “temple.” Travellers would do well to mark this one down as one of the best Lombok spa resorts. The Oberoi Lombok on Medana Beach was well ahead of its time when it opened in 1997, throwing down the gauntlet to those who thought this lonely corner of Lombok would be hard-pressed to attract upmarket travellers. Today this splendid property has stayed faithful to its boutique identity with services and standards that have identified it as one of the finest beach resorts in Asia. 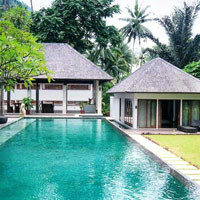 Like its sister property on Bali, the resort follows local design with great attention to detail. Overlooking the Gili islands (boats drop off guests daily with pickups late afternoon). The property is set in 24 acres of picturesque grounds with outstanding cuisine (a favourite is the Rijsttafel) with villas and pavilions better suited for couples. As a romantic Lombok resort, this one is hard to beat. There is kayaking, windsurfing, tennis and a spa. Or splash down in the 40m pool. WiFi is free throughout. Pure eye-candy for travellers in the far south of the island is Kuta Beach, a long arcing white-sand bay overlooking turquoise seas and ringed by low hills. This is a popular backpacker haunt where the joys are purely rustic -- read, motorbike, cycle, or swim. This is essential Lombok with few mega-tourist trappings and a pace of life that is splendidly unhurried. For lodgings of a better sort try the 102-room Novotel Lombok set in verdant grounds and offering Sasak-style architecture. It is right on the beach with a generous sea-fronting pool that catches huge rays. This is a four-star digs with Superior rooms offering a 32-inch LCD TV, Broadband connection, hairdryer and coffee and tea-making facilities. Sasak villas up the ante with a touch more class, thatch roofs, private pools and enough trimmings to keep the family, or your better half, happy. The largest meeting room here can hold 120, theatre-style, so do give it some thought for your next small corporate meeting in Indonesia. Weddings are an option. And children's menus, games and a Kids Club will keep younger guests thoroughly entertained. If it’s fun, adventure, or a challenge that you’re looking for, overcoming Mount Rinjani – all 3,726 metres (12,200 feet) of it – is an opportunity that can’t be missed. But be warned that this is not a trek to be taken lightly, or one that, for most people, can be attempted on a whim. Some preparation and training would be wise, and you should come armed with the right gear, including cold weather clothing (for the frigid summit, when you make it there) and hiking sticks, which will likely prove useful in the treacherous descent. 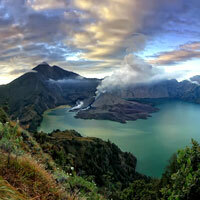 Though Mount Rinjani can be attempted without help, hiring a guide is strongly recommended. Our pick is Rudy Trekker, a well-reputed and eco-minded company based in Senaru. Your guide and tough-as-nails porters will encourage you on your journey upwards, and will be there to prepare sumptuous meals (surely devoured completely after all the intensive cardio) and help bear the heaviest of the load, including several days worth of water, and the tents and sleeping bags that’ll keep you toasty in the chill of the night. When choosing your trekking package, consider your fitness level and how rigorous you want the climb to be. If you have time, we’d recommend choosing a four-day/three-night package, which offers more time to rest in between bursts of climbing. If you do choose this option, expect to climb up to about 2,600m on the first day to Rinjani’s breathtaking crater lake, where you will camp for the night. Most climbers will reach the crater lake in time for sunset. Keep your camera handy for the staggering view: the bright turquoise of the lake, the wisps of smoke rising from the mouth of the active volcano, the clouds below awash with an almost neon-pink hue - you’ll be glad you made the journey. 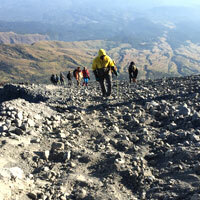 On Day Two, you’ll wake up in the wee hours to push onward to the summit. It’s a treacherous uphill trek, but “mind over matter” will win the day. Our guide told us that a French couple in their 70s had made it to the summit a few years before. It took them almost triple the time as what’s typical, but “they just refused to quit,” he said. “They just took one step after another.” Rinjani is the seventh tallest mountain in Southeast Asia. Once vanquishing the summit, you’ll return to camp before continuing on to the mountain’s natural hot springs (2,008m), where you can enjoy some much-deserved R&R. The following day, you’ll continue on to the Sembalun crater rim (2,639m), fabled for its stunning views. Finally, on Day Four, it’ll be time to embark on the long descent back. You’ll step off the mountain dust-covered, exhausted, spent, but pleased. If you have time, and even if you don’t, consider taking a trip to one (or all three) of the Gili Islands, located to the north of Lombok. Is it parties you’re looking for? Or fabulous dive sites? Perhaps you want to be pampered with a massage by the lapping waves of the sea, or have your own Robinson Crusoe experience on a desert island. Whatever it is, the Gili trio will likely have what you’re seeking. You just have to look in the right place. 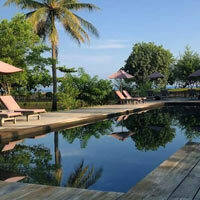 No Lombok fun guide would be complete without a mention of these wonderful boltholes. Each of the three islands – Gili Trawangan, Gili Meno and Gili Air – has distinctly different characteristics. The largest, Trawangan (known colloquially as Gili T), is by far the most popular, and most cosmopolitan. It’s chock-full of bars, clubs, and hip guesthouses, most of them squeezed together by the coast on one side of the island. It’s also home to several reputable dive schools, including Blue Marlin Dive, which was founded in 1992 by the highly regarded technical diver Simon Liddiard. Accommodation options are in no short supply on Gili T, though don’t expect any big names (for now, at least). Some good options include the rustic Les Villas Ottalia, a collection of clean and cozy villas, most with their own private pool; the idyllic Desa Dunia Beda Beach Resort, a quiet retreat away from the main drag; and the quaint, but modern, Danima Resort. Though some peace and quiet can be found on Gili T, it’s not the best place for it. This is a party island. Gili Meno, the smallest and most undeveloped of the three islands, might be a better fit if you’re craving some relaxation and solitude. Even in high season, the island, which is only two kilometres long, feels very much off the grid. There’s not much to do on Meno, other than getting a massage or going on a leisurely snorkel; but that might be exactly what the doctor ordered. The island has a few small hotels and B&Bs. Some recommended picks include the Mahamaya Boutique Resort, a modern haven with its own private beach; and the palm tree-covered Kebun Kupu Eco Resort. Can’t choose between the party flavor of Gili T and the tranquility of Meno? Gili Air, the last of the island trinity, might be the Goldilocks choice. A few cafes and bars have started to set up shop on Air, which is located the closest to Lombok. The island also boasts a handful of dive centres. Of the several resorts and B&Bs on Air, the homey Manta Dive Gili Air Resort comes recommended, as does Scallywags Smugglers Hideout, a simple but comfortable joint. Getting to any of the Gili islands from Lombok is fairly straightforward. Just hop on a public boat (or a private chartered one) from Bangsal harbor. The journey is done in under 25 minutes. Hopping from island to island is also a simple matter. Public and private boats are relatively frequent. Check with your hotel about timings and pricing. That wraps up our Lombok resorts review and fun guide. Pick from dream villas or shacks on the beach – or a climb up a towering mountain. It’s all here. Room rates in Lombok and the Gili islands will vary somewhat between the dry high season (summer months from April to September) and the wet winter low season from October to March. The dry and relatively cooler weather from June to August is particularly favoured by travellers. Always check with your local travel agent and scour the internet for the best available rates (BAR). In general, you can expect to pay between US$60 and US$160 for a three to four-star resort in Lombok or the Gili islands. 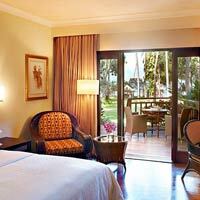 Higher-end five-star resorts can set you back US$250 to US$300 a night or more. The exchange rate is roughly US$1 = Rp14,100. See our Lombok map. Jayakarta. Tel: [62-370] 693-045-8, fax: 693-043, (e-mail: lombok@jayakartahotelsresorts.com or lombok.jayakartahotelsresorts.com). Hotel Bintang Senggigi. Tel: [62-370] 693-570, fax: 693-186, (e-mail: info@hotelbintangsenggigi.com or www.hotelbintangsenggigi.com/). Sunset House Resort. Tel: [62-370] 692-020, fax: 692-170, (e-mail: info@sunsethouse-lombok.com or www.sunsethouse-lombok.com). Alang-Alang Villas. Tel: [62-370] 693-518, fax: 693-194, (e-mail: hotel@alang-alang-villas.com or www.alang-alang-villas.com). Pacific Beach Cottages. Tel: [62-370] 693-006, fax: 693-027. Novotel Lombok. Tel: [62-370] 653-333, fax: 653-555, (e-mail: reservation@novotellombok.com or www.novotel.com). Holiday Resort Lombok. Tel: [62-370] 693-444, fax: 693-062, (e-mail: reservationmgr@holidayresort-lombok.com or www.holidayresort-lombok.com). Jeeva Klui. Tel: [62-370] 693-035, fax: 693-036, (e-mail: stay@jeevaklui.com or www.jeevaklui.com). Puri Mas. Tel: [62-370] 693-831, fax: 693-023, (e-mail: info@purimas-lombok.com or www.purimas-lombok.com). Qunci Villas. Tel: [62-370] 693-800, fax: 693-802, (e-mail: stay@quncivillas.com or www.quncivillas.com). Windy Beach. Tel: [62-370] 693-191, fax: 693-193, (e-mail: bookings@windybeach.com or www.windybeach.com). The Oberoi Lombok. Tel: [62-370] 613 8444, fax: 613-2496, (e-mail: reservations@oberoigroup.com or www.oberoihotels.com/hotels-in-lombok/). Dharmarie. Tel: [62-370] 693-050, fax: 693-099, (e-mail: contactdharmarie@commerce.net.id). Graha Senggigi Hotel. Tel: [62-370] 693-101, fax: 693-400, (e-mail: sales@gbsh.co.id or http://gbsh.co.id). Kebun Villa Resort. Tel: [62-370] 692-999, fax: 692-888, (e-mail: info@kebunresort.com or www.kebunresort.com/). Lina Cottages. Tel: [62-370] 693-237. Mascot Beach Hotel. Tel: [62-370] 693-365, fax: 693-236, (e-mail: mascot@telkom.net). Pool Villa Club. Tel: [62-370] 693-210, fax: 693-448, (e-mail: pvc.reservation@aerowisatahotels.com or poolvillaclublombok.com/). Puri Bunga. Tel: [62-370] 693-013, fax: 693-286, (e-mail: info@puribungalombok.com or www.puribungalombok.com). Santosa Resort. Tel: [62-370] 693-090, fax: 693-175, (e-mail: info@santosalombok.com or www.santosalombok.com). Kila Senggigi Beach Hotel Lombok (formerly Senggigi Beach Hotel). Tel: [62-370] 693-210, fax: 693-200, (e-mail: sbh.reservation@aerowisatahotels.com or www.aerowisatahotels.com/hotel/kila-senggigi-beach-lombok ). Sheraton Senggigi. Tel: [62-370] 693-333, fax: 693-140, (www.sheraton.com/senggigi). Svarga Resort Lombok. Tel: [62-370] 619-5999 (www.svargaresort.com). Hotel Tugu Lombok. Tel: [62-370] 620-111, fax: 620-444, (e-mail: lombok@tuguhotels.com or www.tuguhotels.com/hotels/lombok/). Lombok Lodge. Tel: [62-370] 662-2926 (e-mail: sales@thelomboklodge.com or www.thelomboklodge.com). Desa Dunia Beda Beach Resort. Tel: [62-370] 614-1575 (e-mail: ddb@desaduniabeda.com or www.desaduniabeda.com). Danima Resort. Tel: [62-878] 6087-2506 (e-mail: info@giliresortdanima.com or www.giliresortdanima.com). Kebun Kupu Eco Resort. Tel: [62-819] 742-8165 (e-mail: kupumeno@gmail.com or www.kupumenoresort.com). Manta Dive Gili Air Resort. 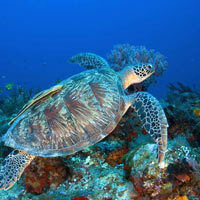 Tel: [62-813] 3778-9047 (e-mail: info@manta-dive-diliair.com or www.manta-dive-giliair.com). Scallywags Smugglers Hideout. Tel: [62-819] 1743-2086 (e-mail: info@scallywagsresort.com or www.scallywagsresort.com).